As we close on this first, very cold month of 2019, we’re yearning for great music to warm us up for the rest of the year. Yes, we have much to look forward to in 2019 (new Mountain Goats, anyone? 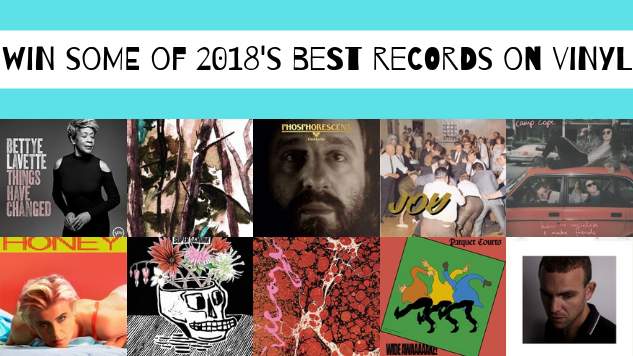 ), but so many of 2018’s records were so downright remarkable that we can’t stop thinking about them. We want to share those with you. Here’s your chance to win some of 2018’s best on vinyl. The grand prize winner will win a bundle of 10 curated records pulled straight from our 2018 Best Albums list, while four other lucky winners will win curated bundles of five. Each bundle will showcase the diverse music 2018 offered. We’ll even throw in an official Paste t-shirt and a CD from the list, too. To enter the contest, click here! All we’re asking for is your email for our two newsletters, which you can unsubscribe from at any time. Easy as pie. Good luck! You have until Friday, February 8, 2019 at 11:59:59 PM to enter.